Israeli soldiers abducted, Monday, ten Palestinians in the West Bank, including an employee of the Waqf and Islamic Endowment Department, in occupied Jerusalem, and issued orders denying a Palestinian woman the right to visit with her detained sons. The PPS office in Ramallah governorate, in central West Bank, said the soldiers abducted Abdul-Rahman Ahmad Shehada, from his home in Betunia town, west of the city, and took him to Ofer prison and military base. It added that the soldiers also abducted a young man, identified as Zoheir Hatem Hweih, from his home in Ein Yabrud, northeast of Ramallah, and installed a roadblock at the entrance of Deir Nitham village, west of the city. 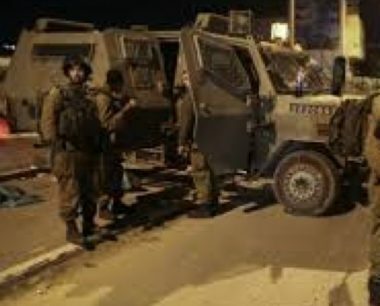 In Nablus, in northern West Bank, the soldiers invaded and ransacked many homes and abducted two former political prisoners, identified as Abdul-Karim Mona, 32, and Montaser Mustafa Shonnar, 28, in addition to Mohammad Shattawi. In Tulkarem, in northern West Bank, the soldiers invaded and ransacked several homes in Beit Lid town, east of the city, and abducted a young man, identified as Sharif Abu Talal, from Nur Shams refugee camp, while crossing Za’tara military roadblock. In Deir Ballout town, west of Salfit in Central West Bank, the soldiers abducted Suleiman Nasr Abdullah, from his home. In occupied Jerusalem, the soldiers abducted an employee of the Waqf and Islamic Endowment Department in Jerusalem, while leaving the Al-Aqsa Mosque through the Bab al-Silsila (The Chain Gate). Firas ad-Dibis, who works at the Waqf Department in Jerusalem, said the soldiers abducted Emad Abdeen, and took him to an interrogation facility in the city. He added that Abdeen works as a firefighter at the Al-Aqsa Mosque Compound, and is one of the scores of Aqsa workers and guards who have been recently abducted and imprisoned by Israel. Furthermore, the army released, on Sunday at night, a child, identified as Hasan Ehab Abu Ghazala, 15, three days after abducting him from his home in the Old City, and ordered him under house arrest for four days. In Jenin governorate, in northern West Bank, the soldiers invaded the home of a former political prisoner, identified as Mahmoud Ahmad ‘Obeidi, who spent eleven years in Israeli prisons, and violently searched the property, in Burqin town southwest of Jenin city, and looted money his residence. In Addition, the army refused to allow a Palestinian woman, a former political prisoner, identified as Reem Hamarsha, from Burqin town, from visiting with her two detained sons, Anas and Omar, imprisoned by Israel, and revoked her permit. In related news, the Israeli Internal Security Agency has reported that the army recently arrested a Palestinian, identified as Ayman Mohammad Ali Fajjara, 27, for Jouret ash-Sham’a village, south of Bethlehem, and added that the Palestinian reportedly “confessed during interrogation to carrying out a stabbing attack” in Efrat nearby illegal colony, in 2016, wounding one colonist. It said that the Palestinian, a member of Hamas movement, bought a knife and infiltrated into the colony, before stabbing and wounding the colonialist settler. In the Gaza Strip, Israeli navy ships attacked Palestinian fishing boats, and abducted two fishermen. In related news, a young man, identified as Bassam Sami Othman Safi, 22, died from serious wounds he suffered, on February 22, 2019, after Israeli soldiers shot him with a high-velocity gas bomb, east of Khan Younis, in the southern part of the Gaza Strip.